I'm kind of surprised that I had never heard of Tim Powers before now. He's made his mark in sub-genres that interest me and yet his name hasn't come up until this year. It did come up because his books are considered to be one of the major inspirations for the tabletop RPG Unknown Armies. I've been playing in a campaign of this since the beginning of the year and was told that if I liked the setting, I should check out Tim Powers. Last Call is a modern occult noir adventure. It takes place in the real world, but one in which not so far underneath the civilian surface, there is a world of powerful magic that is accessed and manipulated by gambling, consumption, drinking and a range of other very creative and bizarre ideas. I am not a big fan of "the occult" in fiction, generally because I find the aesthetic pretty limited. It's usually either brooding goth vampires, fruity new age suckers or post-hippy wiccans in loose fitting natural fibres. Last Call is totally the opposite. The people who practice the magic are criminals, low-lifes, alchoholic losers, the kind of characters you would expect to find in a Charles Willeford or Elmore Leonard book, except really weird. Actually, some of the characters in Carl Hiassen's book, minus the slight humour, would fit well in Tim Powers movies. But these guys are weird! There is an immensely fat man who is obsessed with maintaining the living vitality in his body, so he's constantly eating living things (like getting out of his car to munch an on aloe vera plant in the yard of the person he is spying on) and smearing his obese, tattooed body with ray-ban to keep the energy trapped inside of him. There are characters who have children and raise them just so they can take over their body when they get old. It's weird and dark. The book opens with a boy who was destined to have his body taken over by his father (his older brother spent most of his time on their roof, acting as eyes for his father), but whose mother saves him at the last minute. We jump forward to the present, where the boy is now grown up and an alchoholic who the more he drinks, the more he is able to bring back a physical manifestation of his wife who died recently. However, crazy stuff starts happening to him and he learns that his father (whom he doesn't know and who is by now a very powerful practitioner) is gathering his magic to call all the bodies he controls (which he "bought" playing a special ancient card game at a certain time and date). After a certain point, the protagonist will lose control over himself and become another empty vessel that his father will use to extend his life. Things are much more complicated than that. There are many other important characters and wrinkles in the story line, but that is the central thread. It's actually quite epic in scale, ultimately, but the whole book is grounded in such a seedy, criminal world that it doesn't have an epic feel at all. I really enjoyed Last Call. It had an anarchic feel in the pacing and behaviour of the characters. Powers comes up with some pretty amazing ideas and he is willing to push them to extreme ends. It took me a little while to get linked into to what exactly was going, just because there is so much detail to the magic and its effects, but once I got a sense of the structure of the world he is portraying, I really got into it. Cool stuff and I'll be keeping my open for other books by him. My reading consumption has dropped off considerably with the start of summer. Nice weather, gaming, weddings, etc. are making it hard for me to sit down and make good progress. Fortunately, I've had Conquest in California in my side pocket for the last couple weeks and have been stealing pages from it when I could. I picked it up at an antiques store for a buck. As you can see, the cover alone is enough. I did a bit of internet research and discovered that Gray was a pseudonym for Edwy Searles Brooks, a journeyman British author who produced a massive amount of published work. Conquest was one of his later and more succesful series. Norman Conquest (get it) is a young englishman of excellent character, wealthy and athletic. And fearless. He lives to get in scraps and have adventures. 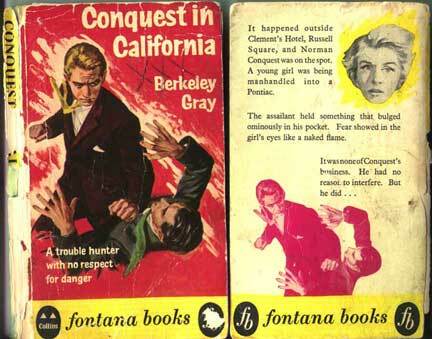 In this one, he rescues a young American girl (a blonde to which he is always attracted) from a threatening thug. This gets him caught up in a tale of small-town corruption in Clam City, California, where Conquest goes to show American thugs how its done and clean up the mess. There is a lot of not-so-subtle British pride here. I wouldn't go so far as to say it is anti-American, but you can tell that the writer and the intended audience have a bit of a chip on their shoulder. Lines like "Conquest swung his fist up with a short, outward jerk of the elbow and struck the American on the side of the jaw," give a good sense of where this book is coming from. It was a fun read, particularly for the setting and the side characters. The plot is pretty straightforward and moves forward a bit too clunkily. There is a lot of repetition of exposition and a lot of the author telling us how awesome Norman Conquest is. Sometimes it is very effective, but generally you get the feeling that the whole thing could have been cut down a lot and the book would still have been entertaining. I would check another one of these out if they come across my path. Check out these sweet covers!